Tripping over your own feet when you head into the garage? Does it have stuff piled so high that the last time you parked the car in there was when you moved into your home? If so, don’t fret. 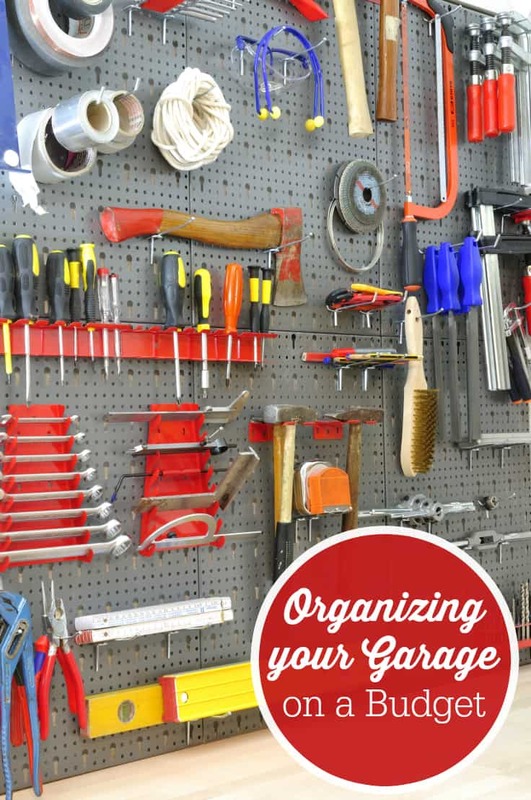 You can organize the garage on a budget with just a few easy tasks and some elbow grease. Tip 1. Empty it out…completely. For most garages the biggest issue is that there is just too much stuff packed in there. To begin, if your garage really is packed to the gills, you’ll need to empty it out. This is where that elbow grease comes into play. Remove literally everything from your garage and go through it. Decide what you will be keeping and what you will be selling, donating or tossing. Once you’ve made the decision, take care of the piles so that you don’t bring the clutter back in. Tip: do this on a nice day when no rain is in the forecast. You don’t want you or your stuff to get soaking wet! Once you’ve got the donate pile, trash and sell piles taken care of, it’s time to put the items you’re keeping back into the garage! In an organized way, of course! Tip 2. Use a peg board for tools. For yard tools, grab a peg board and some pegs from your local home improvement store and hang them up. You could also use a metal trash can to stand them up in too if you prefer. Tip 3. Get a toolbox or metal basket to organize tools. For hand tools, you’ll want to use a toolbox of course, but if you don’t have one, metal baskets will also work provided you separate the tools out by size and type. Tip 4. Keep kids’ toys easily accessible. Kids’ outdoor toys should be kept in a central area that is easily accessible to the outside door for little hands and feet to get to. Make sure that the door stays locked to your garage so you don’t have any run away children going outside without a parent knowing. Tip 5. Utilize shelving…get creative! Shelving is always needed in a garage, but if you can’t afford the more expensive shelving units, you can make your own budget friendly shelves by using milk crates, old drawers or old pallets. Tip 6. Kitty litter to the rescue. To clean up any oil or grease spills that may be a hazard on the floor, drop some kitty litter down and let it sit. The litter should soak up anything that is there. Tip 7. Store what you don’t use. If you store out of season gear and toys in your garage, shrink what you can down using vacuum bags then store the rest in totes that are clearly labeled so they’re easy to find. If you keep the mindset of “everything in its place” when you’re organizing your garage, you’ll win the battle against clutter. Garages tend to become a catch-all so they can get out of control in a blink of an eye. If something is removed, make sure you put it back where it goes and make sure you stop sending things to the land of no return once you’re done with them. Donation items should be donated immediately. Items to be sold, should be sold immediately. Doing that thing alone will help you keep things under control. How do you keep your garage organized? What I really need to get is the Peg boards for my tools. I have them on shelves and they are hard to find! I can see if I had peg boards then it would not be hard for me to find my tools that I need! I have a small garage, so I do not have a lot of room to store things. So I do need to use some of these ideas to help me get my garage more organized. Emptying it out completely is where I need to start to find out what I need in the garage, and not have other junk stored there! Love the pegboard idea! My garage was fairly organized until my son moved in with all of the things he had collected over the years. All of his things wouldn’t fit in my basement, so the garage took the overflow. He is hoping that I might be able to get my car in this coming winter! I really need to do this as my garage is a disaster!